Every day you let go by thinking about that thing you want to do is another day you’re not working towards what you love or passionate about. We’re both still working on (the balance of friendship + business). However, with a lot of passion, comes a lot of emotion. I guess we’re perfectly imperfect. How would you each describe yourself in 5 words? Curious, passionate and always dreaming. It's funny to say, but it all stated from reading a book! I (Axel) got my hands on this biography called ‘100 Things’ by Sebastian Terry (whom we later interviewed in our ‘My Bucketlist journal’). As I was laughing my way through the book I got inspired to write down my own bucket list. I really wanted to share it with my friends and dropped the book off at Ash’s doorstep as a surprise for her Thailand trip. She absolutely loved it and she messaged me from a sandy beach saying how she was writing her own bucket list, and we should share them when she got back! A few weeks later we were drinking coconuts on Ash’s balcony to celebrate the last day of summer (March 2013) and decided to share our bucket lists. We had SO MUCH FUN, and five hours later we had only made it to number 30 on each list as there was so much discussion around each item; why you want to do it, what’s stopping you, comparing things we each had done that the other hadn’t etc. We were laughing until we were crying, and cannot recommend highly enough that everyone do this with a close friend as a fun night in! The reason we stopped when we came to #30 was that Ash had ‘start a business with a friend’, on #13 Axel had 'start a business‘ so when Ash read this we just looked at each other and we both went ‘Why don’t we start a business together’ in sync! It is pretty crazy but it all escalated from there. It was around 1am at this stage and we started bouncing some ideas but didn’t come up with ‘it’. A couple of days later Axel remembered the idea of a travel journal she had been wanting to make for the past 7 years and thought - “this is perfect! It includes travel, writing and releasing a book - all things Ash loves!” So, she wrote Ash a message at work saying ‘I got it... this is it!’. Ash was super curious and wanted to know what it was straight away, but Axel just wrote ‘come to me after work - this is it, you’re gonna love it’. At 5pm on the dot Ash rushed out the financial planning job she was in, jumped on her Vespa and scooted in full speed to find out - and she LOVED the idea. We had only known each other for 6 months so we both suddenly started to wonder if the other would follow through. There are so many things you say with friends and then it ‘runs out in the sand’ as we say in Swedish. So I (Axel) was like ‘Ash, I am super serious here - when I say something like this, I’ll do it! - Will you?’ Ash was like ‘Me too - I’m all in - but I’m not sure if you will follow through’. So we made a pinky promise right there and then that we’d both see it through. A few days later we had a name and business ABN, and a few weeks later when Ash’s uncle was going on a business trip to China, he suggested we come along, research and source printers. The rest (as they say) is history! 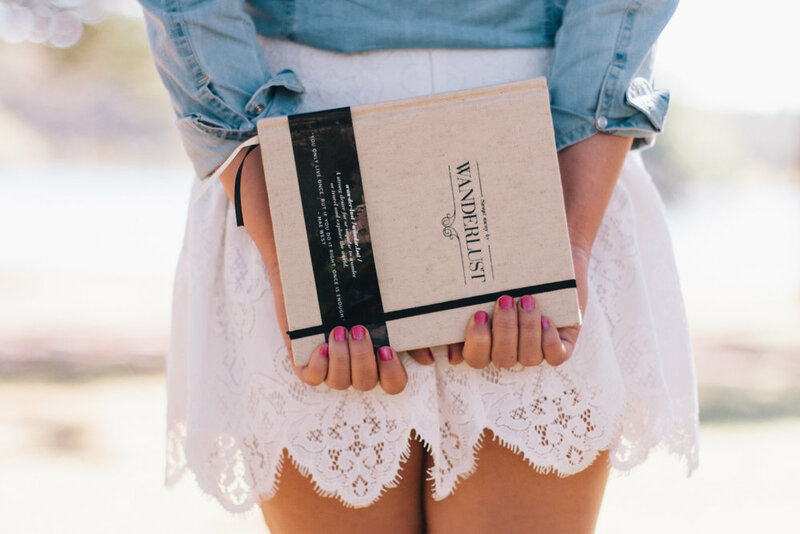 We create journals that inspire people to follow their dreams, live life to the absolute fullest and capture every moment of it. A place for you to ‘Insert YOUR Story’. Are you doing what you thought you would be doing 10 years ago? 10 years ago the world was really my playground. I had so many things I wanted to do, and I threw myself into chasing all of them straight after school. Originally from Sweden I was living and working all around the world, from working as an Au-pair in the US, traveling the Trans-Siberian railway, living in a Norwegian village and working in a bar in Spain, to road across tripping Australia, backpacking Asia and being an English teacher in Thailand (with my ‘Swenglish’). After 4 years of traveling I felt the urge to study film & TV, as I loved story telling. Then I pretty much just settled and started to study film in Perth. I remember they asked us all on the first day of studying ‘what is your goal here and what do you want to become?‘ Most people answered that they wanted to be filmmakers. Me, I had seen a documentary about working as a TV director (the person in the control room who speaks in the ear of the presenter and calls all the shots to the camera men and vision switcher) and thought ‘I want to be THAT person’. I answered that was my goal! Two years later I was extremely lucky to get my absolute dream job at ABC news in Sydney as a news director. I have since worked on news and current affairs internationally, and loved every moment of it. About a year into my career, Ash & I shared our bucket lists and decided to start this business creating our first journal ‘Swept away by Wanderlust’ (which I had the idea of when I was 19). At the time, we were both working full time, so suddenly we spent a lot of our free-time working on Axel & Ash. A year after inception our little business was growing so rapidly that I decided to leave my full-time role and was lucky that I still had lots of opportunity to continue to freelance in TV. I was super excited to be able to create the freedom to work with Axel & Ash full time and travel the world when I wanted to, and still go back to my day job when needed. So to answer the question…If I am doing what I thought I would be doing 10 years ago? To be completely honest I’ve never been a person who plans or worries about the future (something that drives Ash mad). I always live in the moment and enjoy every day as it is so I don’t think I ever really thought about a future plan! Saying that - I did have the idea to create a travel journal - and wanted to work in TV. But If you asked me 10 years ago what I would be doing now - I don’t think I’d believe that I would have already had my dream career in TV and be running a successful business where I get to travel the world together with my best friend and partner in crime. So whilst part of me always feel that anything is possible - another part still pinch myself almost every day that I actually get to do what I do! To be honest, I never thought I would be doing what I am doing ten years ago. But I always knew I would be doing something that I loved as I am a huge believer that life is too short to be doing something every day that you don’t love. 10 years ago, I was working and studying Financial Planning. I really enjoyed it and it taught me a lot about business and the global economy. I worked in the industry for over 7 years. However, since I was young, I’ve always loved writing. I always kept a journal and loved reading, writing short stories and writing about my travels. Although, ten years ago it was just my passion and something I dd on the side - I never thought I could or make it a profession nor do it full-time. That was until my world and perspective completely changed when I was 22 and went overseas for 5 months on my first big independent trip. When I was travelling through Europe, I realised how big the world really is – how much culture, history and art is out there. I saw and met so many creative people that embraced their passions and were following their dreams. I was getting lost in all the museums, galleries and city streets. When I got back to Australia my thoughts were so different and for the first time I started exploring writing as a potential future job. I started taking courses and learnt more about writing. It was then about 5 months after I got back to Australia that I came to hear a beautiful story about my grandfather and his time in WWII. When he opened up and shared his story with me, I realised that this was the story I had been searching for. What followed was an amazing 2 years of interviewing my grandfather, something I absolutely treasure. Learning and writing his story made me realise how much I loved writing and it pushed me even further to making sure I was doing my passion all the time, not just on the side. Then life happens (as it always does) in the most incredible way, and Hanna and I met in Nov 2011. It was perfect timing, because I think we both were at the stage in our lives where we were open to new opportunities and wanted to create and do something that we both loved. I absolutely treasure and love every single day at Axel & Ash, and feel extremely grateful for where we are today. We have met so many amazing people who have supported us on our journey. It did take a lot of hard work and perseverance, but it was all worth it, because you can never regret doing something every day if you truly love it. To me success is all about being able to be happy every day and living a life you love! We all have different things that drive us, and I think success is about being content within yourself. The feeling of being loved by the people you love, having fun with new friends and adventuring the world - all of these make me happy and having created a life where I can experience all this when I want to makes me truly happy, and successful in my eyes. Success and happiness go hand in hand for me. I think if you’re happy with what you’re achieving, the life you have created and continuously creating, then that’s success! It doesn’t matter what material things you have or where you are in the world, it’s about a feeling within yourself that you feel genuine to who you are, you’re living and loving life to the best you can and always striving to be the best version of yourself. I do feel successful, because I am very happy and incredibly grateful for the many wonderful people and things that I have in my life. I feel proud of how we have grown our business, the people in my life and all the places we’ve been fortunate enough to see and experience. I still have a lot of dreams and goals I want to achieve, but that for me is what keeps me feeling successful and happy, by continuously learning and following my heart and dreams. What do you still want to achieve (personally and/or professionally)? Personally - sooo much! That’s why I love having my bucket list, as I write down and journal all those little things that I dream of, and the list keeps on growing! Currently I am working hard to learn to walk on my hands and play a song on the guitar (bucket list items which I made my new year’s resolution). One of my biggest personal goals is to naturally heal my eczema. It’s been an ongoing battle in my life which I have tried to heal naturally for the last 10 years after losing all faith in medical system. Once I’ve been able to completely heal and understand my condition, I want to help others in the same situation. There are thousands people who wake up in pain every day, and they’re told by doctors ‘you can’t heal eczema’. If you ask me what I want to be when I grow up, I have endless answers… actually some are on my bucket list: Work with wild animals, work and live on location on a ‘real’ feature film (I’ve worked on low budget ones and want to experience how it is on a ‘real’ film), create an art exhibition, work on every continent (I crossed off 4 out of 6 so far, short of Africa and South America) and produce a documentary. I love trying new things and learning, and I don’t like routines. I never had a true 9-5 job in my life, nor did I ever stay in a job for safety - I get bored doing the same thing for too long and need new experiences. That’s why I love Axel & Ash – never in the last 5 years has it felt like work. Personally, I have a lot of things I would like to achieve. However, top of my list right now is that I would love to live in another city or country, learn another language and play the guitar. Business wise, there is so much… I love learning and really looking forward to taking and making ‘Axel & Ash’ a global brand. We want to be that guidance for people who may not believe in themselves, and let them know that it is possible to achieve your dreams if you believe you can and really want to. As the days and years go by so quickly, every day you let go by thinking about that thing you want to do is another day you’re not working towards what you love or passionate about. I studied film & TV, so when starting Axel & Ash, I had no idea about publishing, book writing, international trades, or anything else in this field. I don’t think you ever need to know much - I think it’s about wanting something so much and being ready to work hard for it - then you will learn and figure it all out along the way. My dad ran an advertising business so growing up I always played around with the Adobe design suite and I’ve always had a strong passion for design, photography and creating things, which has helped a lot, and is my strongest part in this business. Having said that, I do my research! When I have an idea or something I want to do - I research it to death! So I guess that’s the study of life, and since starting this business I’ve googled or skimmed books about everything I wanted to learn at the time. I studied Business Management & Financial Planning, which really helped with the business side of running your own! I also studied a number of short-writing courses which gave some insight into self-publishing and travel writing. However, I have definitely learnt the most by living and doing. Just by talking, researching and doing the jobs on the go, you learn a lot along the way. Also, not being afraid to approach people and being curious and asking lots of questions is what helped a great deal, people are often afraid to approach people, but you have nothing to lose, but everything to gain. Definitely making our first book ‘Swept away by Wanderlust’ and getting it spread all over the world. I think because that was the pinnacle and meant so many things in one. It taught us so much personally and professionally. We worked full-time whilst we were creating it and it took us a year to have it finished. We persevered, we learnt, we built relationships and made a dream come true. It really cemented that we could do this, that we could take a dream and turn it into a reality. Then, everything after that really has been so rewarding. Meeting and receiving emails by people who have purchased our products, and travelling to all corners of the world. It honestly has been such a crazy journey, it does feel surreal when we think about everything we have done, but at the same time it also feels normal, like this is the path we were always meant to follow. I must say getting our books onto the shelves of Urban Outfitters. When I was an Au-pair in San Francisco 13 years ago I first visited Urban Outfitters in Union Square and fell in love with their book section. I’d travelled so much I wanted to find a really cool travel journal but it didn’t exist! I had a clear vision of what I wanted in my mind and came up with the idea to create a really cool one myself. This was another of my millions of ideas, and it wasn’t until meeting Ash 8 years later that the idea got the fuel to become a reality. Since the start of our business I always told Ash that my dream was to one day see it amongst the books at Urban Outfitters. We wrote to, and chased Urban over half a year and had almost given up when months later they suddenly contacted us and said they want to stock our journals… I couldn’t believe it! One of many amazing business moments I’ll never forget. Tell us about your workspace and what inspires you about it? What inspires me about the workspace is the vibe and energy. There are some days that I just need to be in my own space so I can focus and punch some work out. But then there are times that I crave to be in a cafe or space surrounded by people and life. We’re both fortunate that we can pick our locations to be wherever we feel we need at the time. Learning how to work together with a friend, and to compromise as business partners. Ash and I are like sisters. We are best friends and love each other to death - but we are also strong-minded, extremely passionate and like things our way. When you are 2, it’s 50/50 and that has made it really hard to agree on some big decisions. We have learnt so much about each other over the years, and also ourselves. We’ve done 6 month trips together every year for the last 3 years and we have honestly had the best time. Definitely learning how to work with another person creatively has caused some frustrations. But, we do have so much love and respect for each other, in those moments of frustration I don’t think we ever stopped believing that we could work it out, otherwise we wouldn’t still be standing here. Axel is an amazing business partner & friend. I’m so grateful and have had so much fun creating this brand with her. I am the biggest perfectionist. I take extreme care in the design of things and it has led to very frustrating situations where Ash has thought something is looking great whilst I think it is so bad it can’t be seen by anyone out there… not even the dog!. This has certainly lead to frustration tears from me. To me ‘good enough’ isn’t Good Enough! I like things ‘perfect’! I remember receiving the first sample of our Wanderlust book only a day before we had 150 of our friends, influential people and media invited for the launch (our first ever) and I looked at it and due to some pages which I hadn’t been able to finalise to my liking (as it’s 50/50) I just hated it. I was so embarrassed for people to see it, whilst Ash was super excited. But, looking back I cherish every moment. It sounds cliche - but I truly do. Also the tears, arguments and hard times we’ve had are such a big and important experience of this whole journey and life in general. You have to have lows to enjoy the highs, and I cherish every part of this experience. I did have some tears when Hanna and I had a disagreement. It’s so hard at times to separate the friendship and business side. We’re both still working on that, and I’m not sure if we will ever combat it. However, with a lot of passion, comes a lot of emotion. I guess we’re perfectly imperfect. Absolutely. I have always been a perfectionist - at school I would always sit up all night before handing in an important paper to perfect it, and I am still the same. When finalising our ‘My BUCKETLIST’ journal I was awake for 48 hours straight before we handed it off to print. It goes with anything I create - If I don’t 100% like something, I don’t want to put it out there to the world. I really want to love what I create and only make items I really want and love myself, otherwise it loses all the fun for me and I just go around regretting things. That’s why we decided to self-publish in the first place, as we wanted to have the freedom to create exactly what we wanted. Yes, I have certainly put a lot of pressure on myself and I think that’s because I have always been such a hard worker. Therefore, I put a lot of tasks on my plate as I want to do and achieve so much. In the first 3-4 years of our business, I really worked a lot of hours both on my full-time job and working on building up Axel & Ash. But I realised over time that it’s really important to have a balance and that you need to put time into yourself, just as much as working. It’s equally important and allows you to be the best version of yourself. So now, the pressure is much less. I still work hard, but I also spend a lot of time on myself. It is incredibly hard to take time off when you have your own business. However, recently I went to Greece for one of my best friend’s weddings and that was the first time in 4 years that I had over a week completely off work. I was so lucky that Hanna was able to take the reins and cover all the work. But, after the week off, I felt incredibly re-energised and ready to get back into it. I realised how important it was to have timeout and take a holiday. When you love your work and what you do, it’s hard to pull away from it, but it is really important to allocate that time to yourself. I am incredibly lucky to have a beautiful business partner like Ash, when something happens and I need time off - she understands and usually tells me to go and not to worry about it. We are lucky to be two of us in this business which means when one of us has something personal or spontaneous pop up that needs to be focused on, the other one is always there to step up and take care of what needs to be done. The thing is though, that we both love our job so much that if we are ever away, we pretty much can’t wait to get back into it! I am the biggest night owl so sleepless nights are the norm for me - I love the darkness and silence and love to stay up! Nights are the time of creative dreaming when finally no-one or nothing disturbs. Anxious - yes I definitely don’t feel happy when time is running out and you have to make those last decisions to finalise something. Being such a perfectionist I find it hard to wrap up. It’s not that I’m never happy - sometimes I nailed something and I love it and I find it perfect. But the other times when I don’t get that feeling but instead feel ‘it’s not good enough' and I want to fiddle around with words or design, but then there is no time for it - that makes me anxious, stressed and irritated! You really put your ‘heart on your sleeve’ when showing a product to the world. It’s months of working, creating, designing and perfecting and I always push myself to create the best content I can. Big projects! especially when we’re making books, as a new book means we have huge print deadlines to meet. When our last book ‘Life’s a Roadtrip’ was made I was working 16-18 hours a day for almost two weeks, so I had a lot of sleepless nights. But you learn from each project and get better next time, so it’s not as stressful. Also, managing the finance side of things can get a little stressful, but again, over time you get more experienced and can deal with high pressure situations in a much better way. It’s funny, I’ve always been seen and seen myself as confident and going for my dreams, and I travelled the world and fulfilled so many of them at a very young age. But looking back I could have practiced this way more. From 16-25 I did so much fun stuff, but still there were many more jobs I wanted to do but I was intimidated to pursue, as I felt I wasn’t experienced or good enough or had anything to offer. Looking back, I wish I had approached production companies or photographers and offered assisting or asked for a job… as I always had it on my mind but the feeling of ‘Why would they ever give it to me’ gave me second thoughts. However, owning a business now I believe that people who approach you with a real passion I always want to help! So my advice to young people - or really anyone - is that whatever job/career you want: don’t be afraid put it out there - immerse yourself in it and ask people around you for help, or rather - if you can help! Cold call companies see if you can help, how you can get in. Show them your passion. Be ready to work for free until you learnt so much that you actually offer them relief and save time and money for them. Then you are suddenly needed and they will want to keep you! Just go for it. Every dream and desire you have - just do it! Never be ashamed or intimidated or think that any dream is too big! Believe in yourself and know that you do have something to offer. Your time, passion and loyalty can be very valuable for others! And don’t be afraid to let people know your dreams and put it out there. Everyone have to start somewhere. Most people want to help when they see someone with a passion! Follow your dreams and do what you're most passionate about. Believe in yourself and you can make anything happen. Don’t be afraid! I have never idolised or been a fan girl of ‘famous’ people, and I think I have a hard time to feel connected to, or admire someone I never met. But I admire ‘normal’ people on a daily basis. It can be anyone who has an amazing story or does cool stuff. It can be the smallest of things - I love unique personalities more than amazing results. If you look in our Bucketlist & Roadtrip books - we’ve interviewed people whose stories we both love! People who dared to followed their hearts - and therefore are living their dreams. The women there all have real cool stories - I adore Tara Winklers’ story and the life-changing opportunities she is creating in Cambodia. I love Kayla Itsines - we interviewed her before she was super big and hosted her first ever bootcamp on Bondi Beach - she was scared she wouldn't even get 100 people to come - look where she is today! That girl has built an empire! There are so many women that I admire who have created such amazing brands and making a huge difference on the communities. 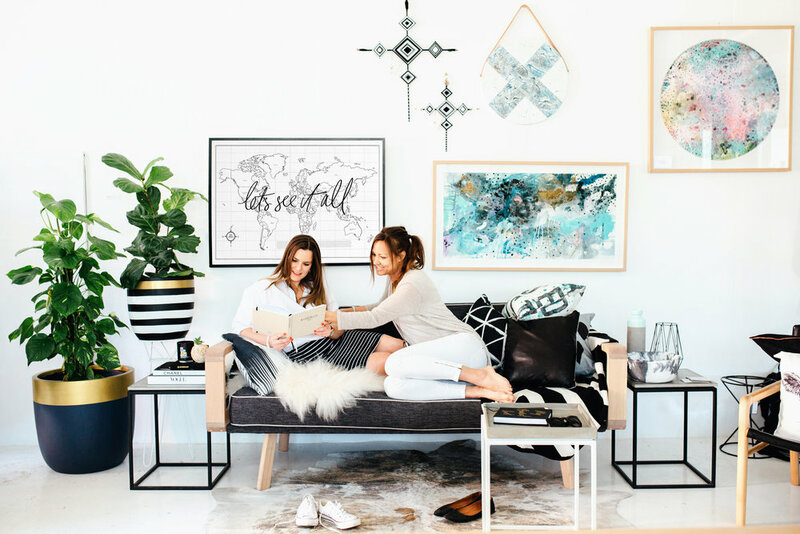 A favourite Aussie duo I admire is Emma Henderson and sister Victoria Beattie, who started the Beach People brand, I love their unique concept for ‘roundie' towels, their beautiful style and growth around the world. I also get a lot of inspiration from other people and pioneers who have really made an impact on the world in other ways, like Malala Yousafzai, Frida Kahlo, Diane Von Furstenberg, Oprah Winfrey, Lady Diana, Coco Chanel, Audrey Hepburn and musicians like Adele. All women who have achieved extraordinary things and made a huge and positive impact on the world in so many ways. I have a thing I call pureness. I love when people are ‘pure’. What I mean with that is that I love when people are raw, straight up, honest, loyal and stand up for who they are, what they think and what they believe in - even if it doesn't get them to a place they want! I also love people who are fun, spontaneous, intelligent, witty, and live outside the box, and don’t take themselves too seriously. I really admire honesty, passion and loyalty. I am very lucky to have an incredible set of friends in my life who push and support me to be the best version of myself. I also have met so many other entrepreneurs who are doing absolutely amazing things and making a huge difference. Those people really motivate and inspire me to be even better and constantly grow as a person. I love working and creating and I still have soo many things I want to do & be ‘when I grow up’. With Axel & Ash I never have time to dive into my other career pursuits, and to fully explore any of them I think I’d need to quit A&A and put my full attention to it - which is something I sometimes day-dream of. However - I absolutely love what we do with A&A and this business has opened so many avenues and I now really get to use many of my other skill sets within our business every day! We both worked hard for so many years to finally be able to hire staff to help with a lot of the work so we can focus on only being creative and actually explore all the avenues we are super passionate about. We are very close to that stage which is really exciting and I wouldn’t want to change it for the world. Yes, I have thought about the option of quitting Axel & Ash and what that would look like. I think when times get tough, you do explore all options, however, it is always a fleeting thought because I then look at everything else and realise that the positives are so grand and I absolutely love what we do and look forward to seeing what we can do with the brand, and really I’d never want to quit. We constantly get the question from people in our surrounding: ’Do you girls need to work now that you just finished your last book?’ Well, despite being in charge of sales, distribution and all the communication to over 800 stores in 21 countries, all the production, marketing, export, finance, collaborations, new product ideas, social media and development you mean…? I think many people think we just come up with the idea, designed the books and have a publisher who does all the rest. Also, that we just travel the world taking nice pictures. They don’t realise that we run our own design & publishing house where we do everything about our business ourselves: From the idea of a product to design and finding the right material and printer, sales so stores want it on the shelves in stores all around the world, setting up distribution to get it there, marketing, design and branding, creating all the content, keeping track of the $$, making sure to pay the taxman and 1000 little things there in between… we do it all. That we just travel and only have lots of fun. We wish it could be like that! But we do work constantly whilst we’re travelling and make sure we have as much fun as possible whilst doing so. I think people forget everything that happens in the background when they see our travel pictures. Everything from social media, to photography to distribution! Not a doubt in the world. For 4 years we both worked 16 hours a day - I spent 8 hours at ABC and every free moment around that went to A&A. We had no experience but stayed up late nights and woke up early mornings to source printers, contact stores, pack heavy orders from home, send media releases, write contracts etc. before going full-time last year. We’ve spent endless hours on A&A in the past 5 years… and I have loved every minute of it. Sometimes I might feel I’d rather go sleep than write that last email but I can honestly say that despite wishing I had more time – I’ve NEVER found Axel & Ash work boring! The quote ‘If you have a job you love - you never need to work another day in your life’ totally relates to me and I feel so grateful that I can say that I truly live and breathe it. Absolutely! I have loved every bit of the journey to where we are today. It’s been full of so many challenges and I’ve learnt so much along the way. From waking up at 5 packing orders before going off to my corporate job, just to get home and pack more orders, to spending 8 hours on the phone on Saturdays when Hanna lived in Perth - it’s all been so rewarding and we’ve had so many incredible highs. I would do it all over again in a heartbeat! 1000% worth it! Our whole business is about inspiring people to live life to the fullest! I want to be known for making people realise that we got one shot at this life, and if you don’t fulfil your dreams - no-one else is going to do it for you. I want to inspire as many people to go out there and follow their dreams, right from the get go. I was never personally encouraged to follow my passions when I was younger, therefore I would love to instil confidence and belief into as many people as possible, for them to know that they can do what they love, no matter how big or little the dream is. 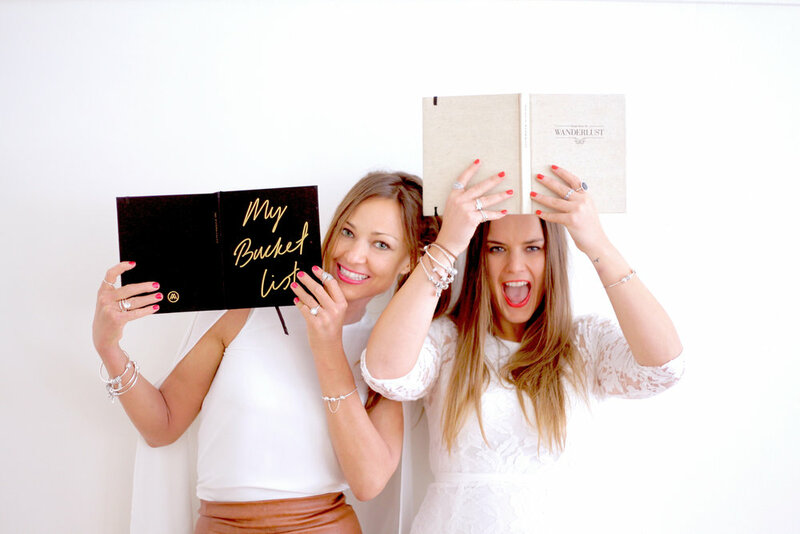 The SAMANTHA WILLS FOUNDATION is about bringing women in business together – why do you think this is important?